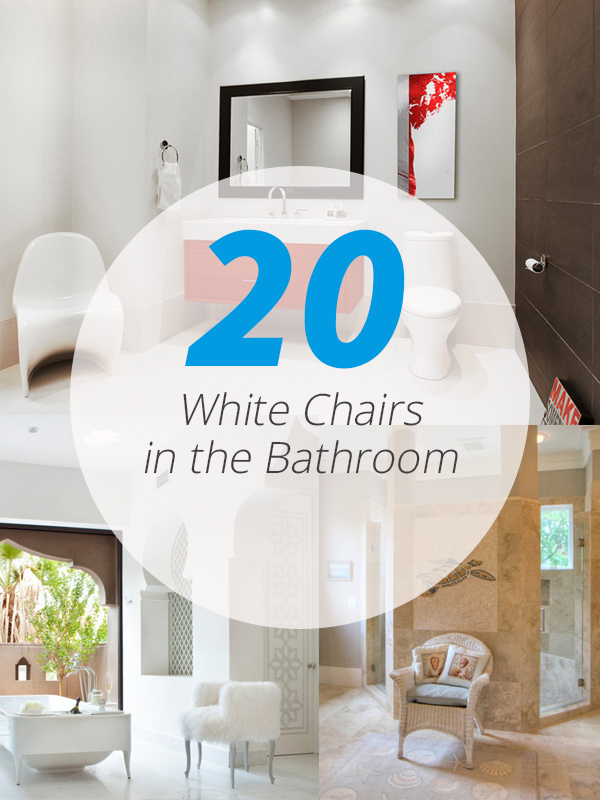 Most bathrooms are white but if you add white chairs, it looks even better! 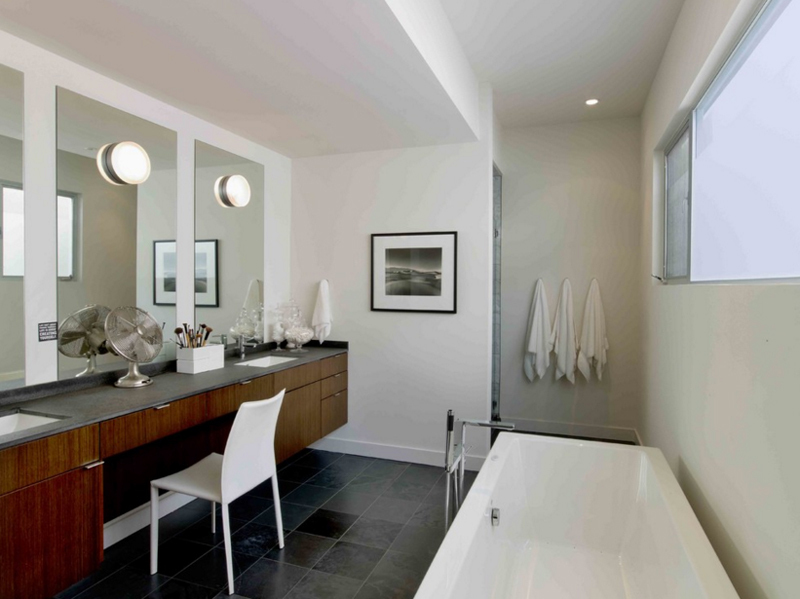 Most often than not, bathrooms are usually in white; if not, it is in neutral tones – something not too loud and why not? It’s not like we want to show off the bathroom right? 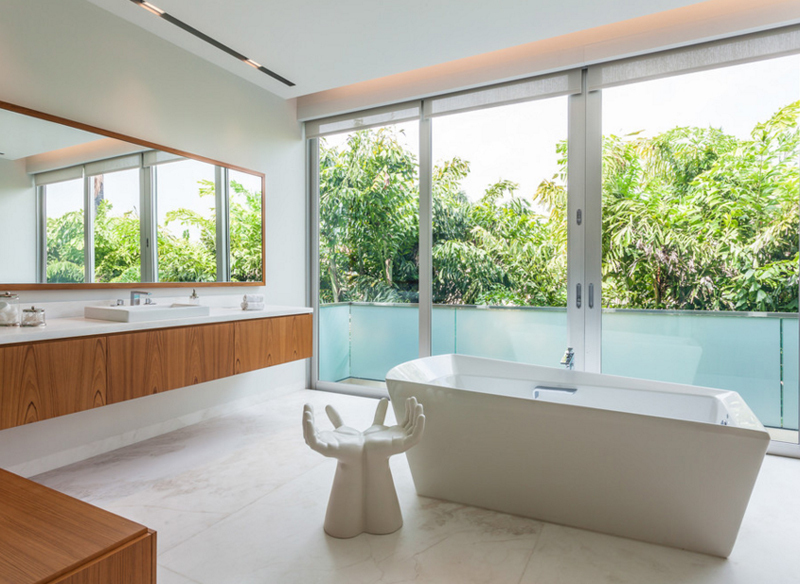 What people want to achieve (home owners and designers alike), is a bathroom that would be comfortable, a place to relax and pretty easy in the eyes. This is a place where we want to do the most private stuff people usually do – and I mean to clean up and wash themselves. Below is a list that includes bathrooms in neutral tones, I personally didn’t do it intentionally, but since we are featuring white chairs, the bathrooms that we were able to find are in white or in beige with hints of other colors. Today, we would be seeing fluffy chairs or stools, ghost chairs and stuffy arm chairs, take a look at the list of photos below and tell us what you think about them! Talking about fluffy chairs – here is an example of one. This pretty chair sure looks like you picked it out of a magazine cover of home living magazines. 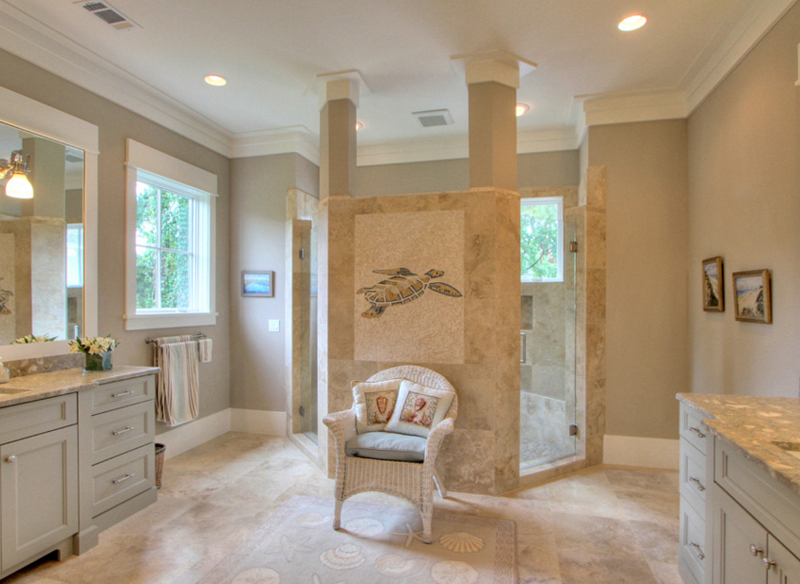 This Mediterranean-inspired bathroom sure looks like it belongs to a princess or something. I love the openings in here – they’re pretty and fascinating. So we see a portion of the bathroom in this Fallingbrook condo unit. It’s nice to see a break from white in a space where people expect white. 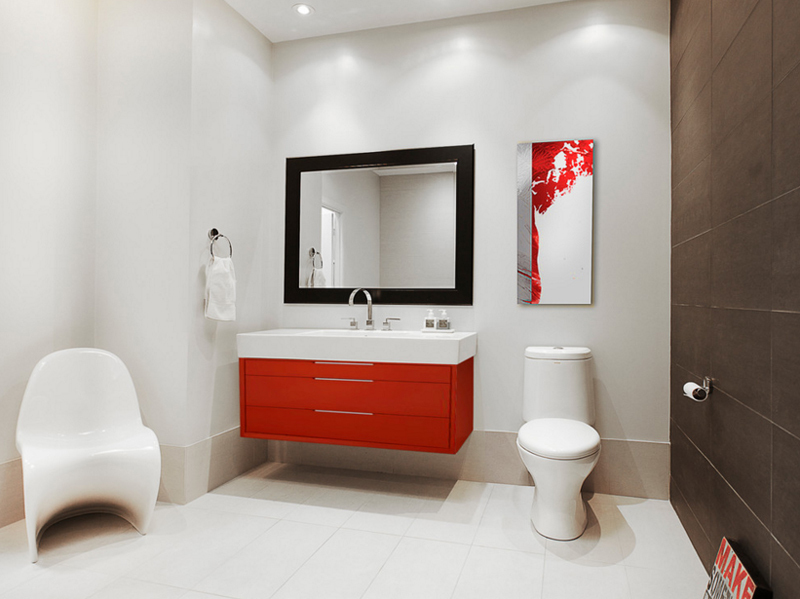 The red drawers below the lavatory sure look neat and complementary with the painting above the toilet bowl. This sure is one large bathroom! I mean, it’s located in a penthouse suite and I think it’s just that they really did a large room for the bathroom. For sure, the owner of this home wanted to have a space as large as this because they spend so much time in here as much as any space in the house. We see a cute yet stuffy arm chair on the part of the bathroom with the awesome vanity. I love how bathrooms can really be as stunning as this one, tons of mirrors, cabinets and drawers and a separated shower area and a lovely bath tub and with tons of lights too! With an arrangement like this one, I would think that the chair beside the tub is where you can place your things before actually dipping yourself in the tub. 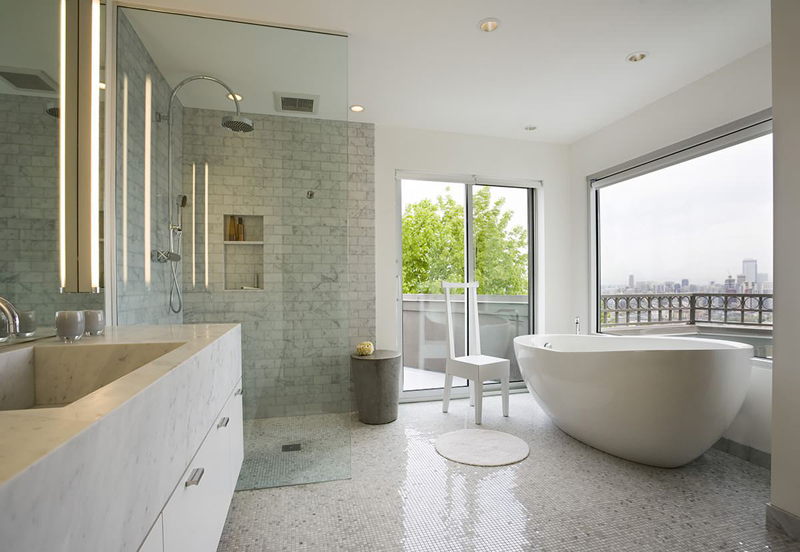 I like bulky looking tubs like this one because it looks really pretty and fun! Using a large ottoman for the bathroom is also an option – it usually is a nice option because you actually add a couple of things in it and at the same time it could be like a coffee table where you can place your drinks every time you are in the bathroom. Now, the chair in this Sunset bathroom us quite interesting and unique! Imagine sitting in it and well, what comes to mind is both fun and funny! If you get my drift. Unique chairs like this one is not just great for the living room but for bathrooms too! This bathroom looks like it belongs to an Asian room; somehow it looks like a sauna or something. 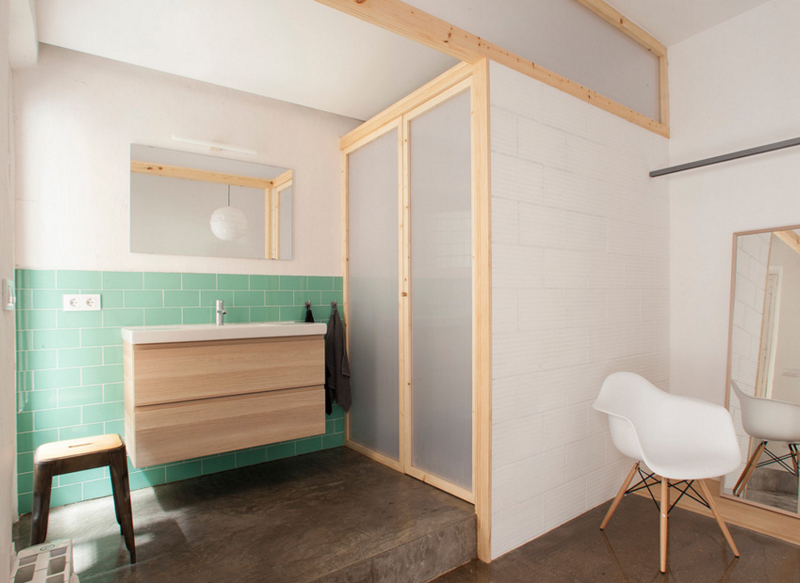 The wood details in this bathroom are simple but it’s not something that you actually see every day. The seats in here are nice addition to the spaces too. Charles Cunniffe Architects sure created an awesome bathroom – a mirror that sure is wide and covers a double vanity; awesome sconces that accent the mirrors and a simple yet fancy white chair completes the look of this bathroom. A combination of rectangular ottomans is placed in the center of the room. With a large space like this one and tons of seating, I would like to think that this is a common bathroom since there are tons of seating in here; but of course, this is just okay if you just love these chairs. 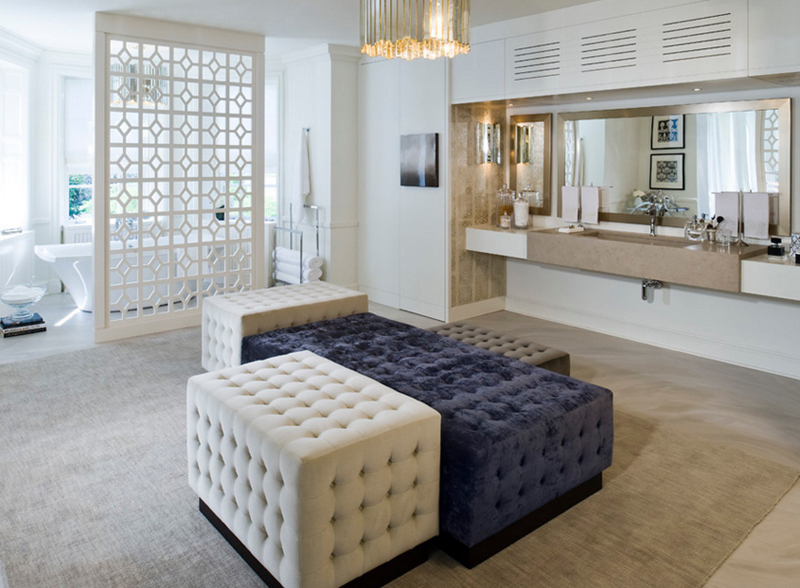 A contemporary bathroom with beautiful furniture, decorations and bathroom supplies but you know that you can actually recreate this bathroom in your house too! Check out what they did with the mirrors; I think it sure looks cool and awesome at the same time! I love the wallpaper used in this bathroom! Although, when I think about it, there are more floral wallpapers seen in bathrooms more than in living rooms or bedrooms. 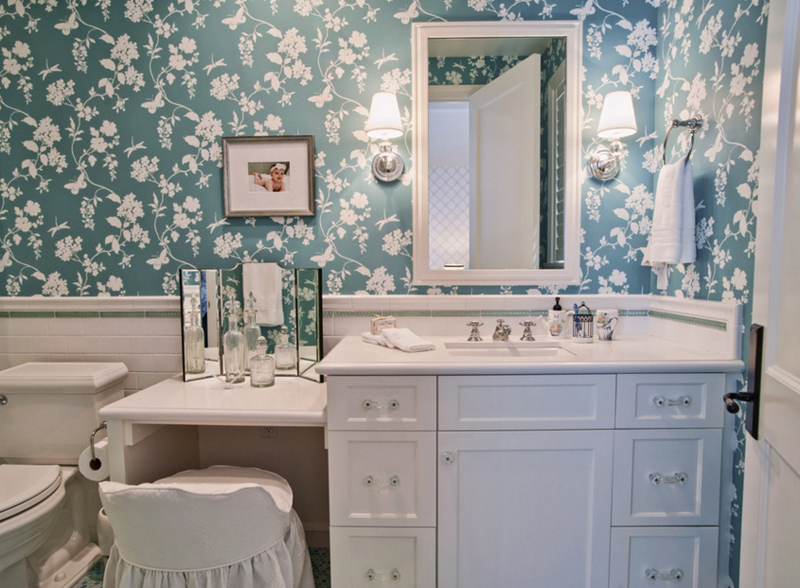 The color of the wallpaper is actually pretty and because this bathroom is in white, the white and turquoise wallpaper combo looks really fascinating. The wide opening of this bathroom door from the bedroom looks intriguing because this house is also done with glass windows, I would like to think that privacy is not really an issue in here because there are high gates too. The white space is really luxurious and fancy looking too. The building material used for this bathroom looks really expensive and classy. The turtle or tortoise printed on the wall behind the chair is quite an interesting addition to this bathroom. What do you think about the colors in this bathroom? What do you think about the fact that this bathroom has a couple of arches to somehow serve as coverings or privacy thing for each lavatory and vanity? An added chandelier in the center of the room is a stunning accent to this space. 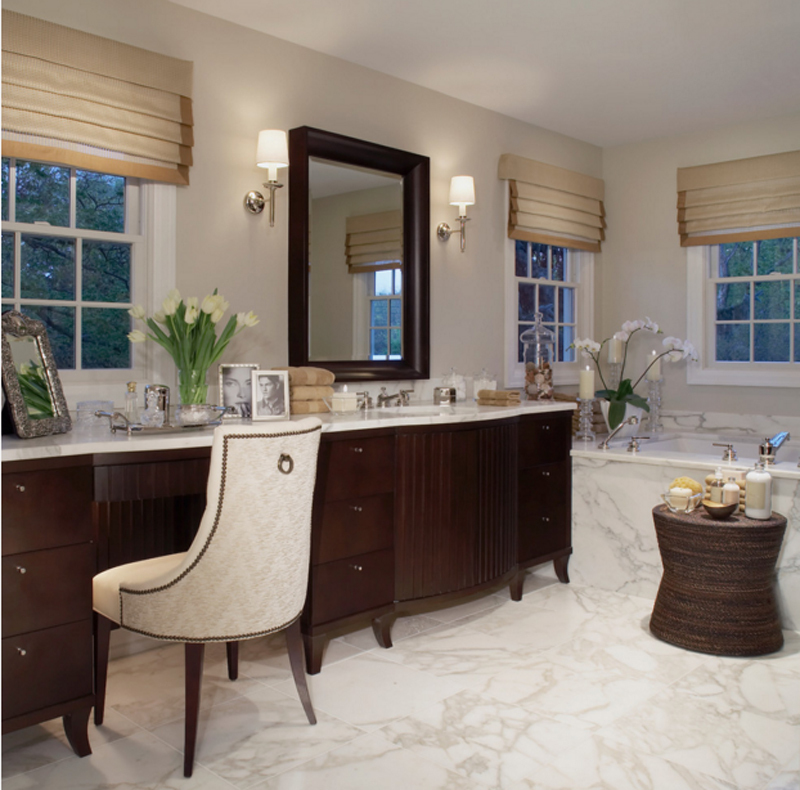 Two chairs are seen in this bathroom – one by the vanity and the other by the window – which one do you think is prettier? 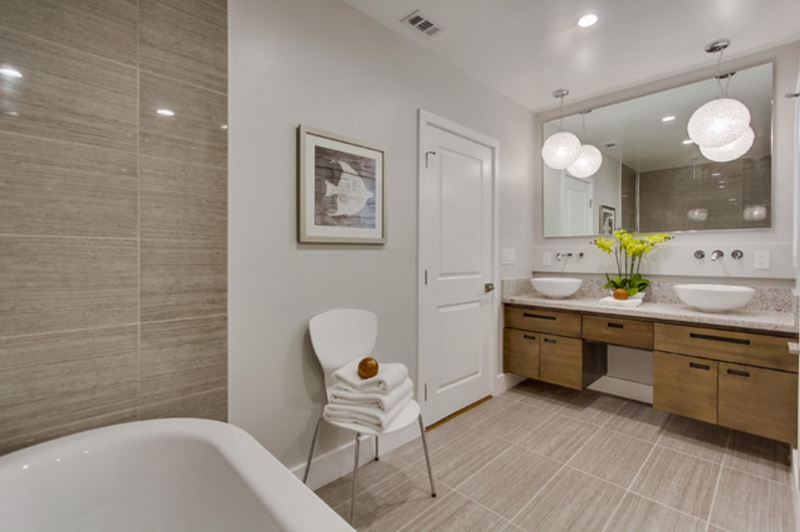 A white, beige and brown color combination in the bathroom – simple, ideal, and very pretty. I like how they used marble for the flooring which means they really have budget for the expensive building material. Notice the prints on the fabric of the chair too. What do you think about this space? 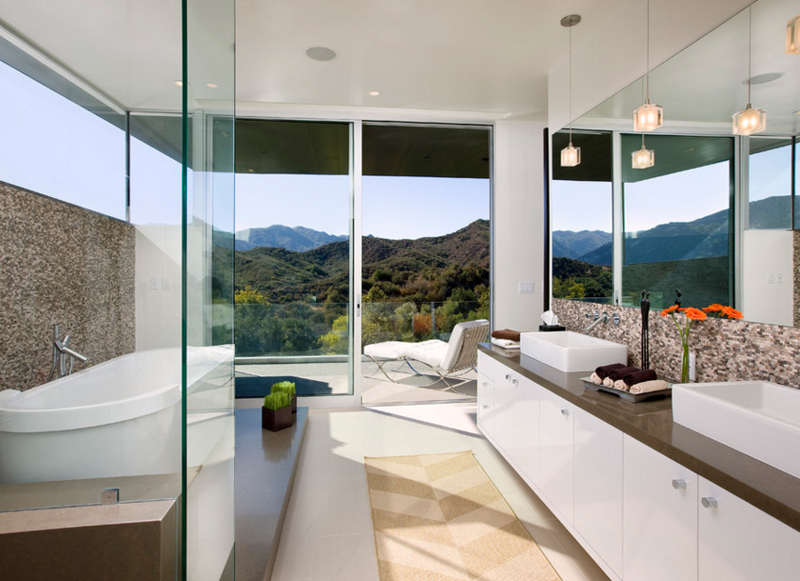 This bathroom with that view of the outdoors (the mountains and the sky, literally) sure looks heavenly and like it’s from another time. I mean the design is contemporary to modern with all the best furniture and fixtures but because of the view, this space is more stunning than when this place is in another location. What an awesome lavatory! I think this is the only one in this list. A curved lavatory with a double vanity. 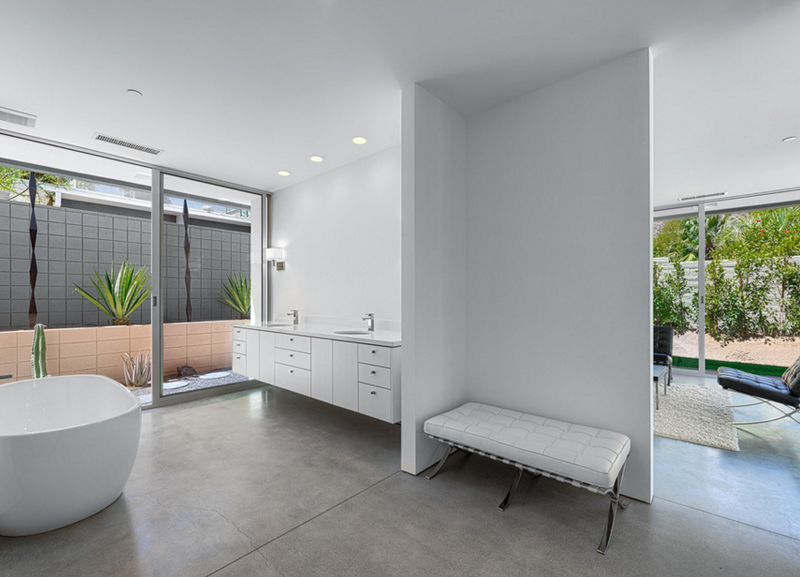 The ghost chair added to this bathroom is neat and a pretty addition to this contemporary design from BG Architecture. A simple, white chair that you can easily buy at any furniture store; an additional seating is never bad for the bathroom. Like you can see in this bathroom, the seat is used to hold the white towels. 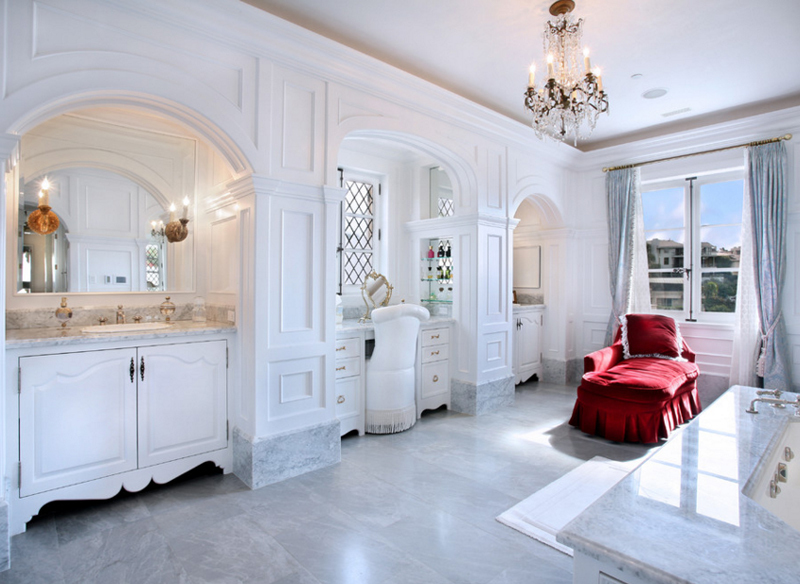 I love the double vanity and the white pendant lights too! 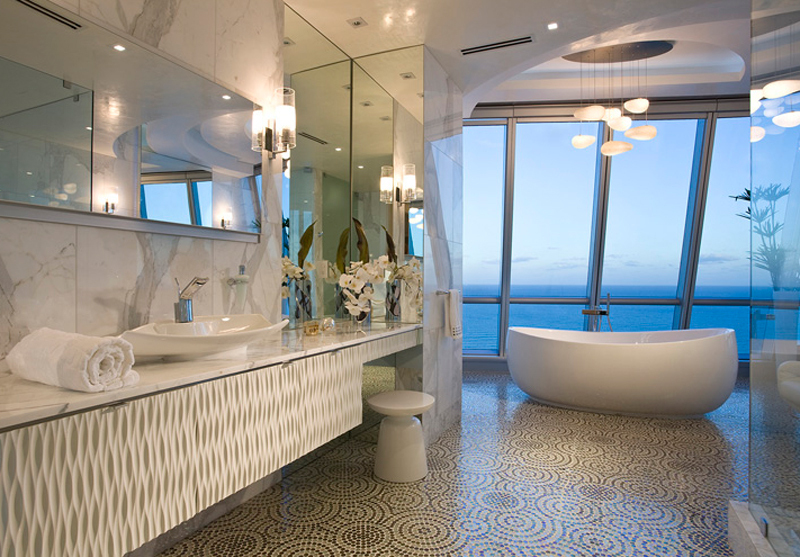 Last but definitely not the least, a stunning bathroom from Defined Luxury. The things inside this bathroom – from the furniture to the cabinets and drawers to the tub and everything, this is one awesome space to beat; from the cute furry white stool to the cute bulbs above the tub, what can you say about this space? If you have seen the list about the 25 Ideas on How to Add Seating in the Bathroom, I think you would have liked this list too. Of course, we see a couple of accent chairs in different colors or designs but since most bathrooms are in white, white chairs are best. More to come in Home Design Lover!